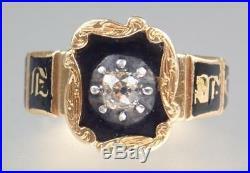 A beautiful antique Victorian 18K rich yellow gold, pale yellow Old Mine Cut diamond, black enamel, hair and rock crystal memento mori In Memory Of mourning ring, inscribed to Letitia D Aboly 1854. 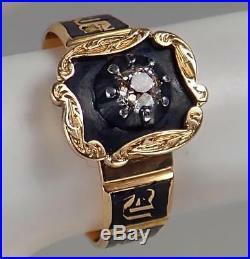 This fabulous solid 18K gold mourning ring has a scrolling floral edged face with black enamel and a wonderful glittering raised prong set pale yellow old mine cut diamond held with a band of graduating black enamel panels with inlaid gold reading’In Memory Of’. The reverse has a compartment with braided hair under a rock crystal panel. The inside is engraved’Letitia D Aboly ob 6 Sep 1854 Ae 51′. The ring comes in an antique textured brown leather box. The ring is approximately a size 6. 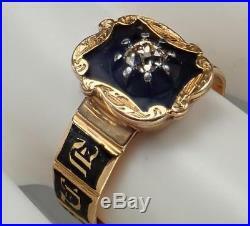 The ring is in excellent condition with overall very light general wear including to the enamel. 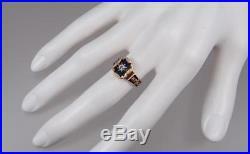 Antique Victorian 18K Gold Mine Cut Diamond Memento Mori Mourning Ring 1854 S 6. The ring is hallmarked inside the band with Queen Victoria’s head, a crown,’18’, a leopard’s head for London, elaborate letter’T’ for 1854 and maker’RC’. 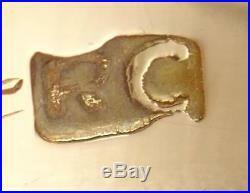 Unusually there is also a date letter’T’ stamped on the outside in one of the enamel panels. The ring measures approximately 11mm x 10mm across the face. The diamond measures approximately 3mm across. The total weight of the ring is approximately 4.1 grams. The box is a little worn. Thanks for looking and please take a look at my other items! We make great efforts to honestly and accurately describe each item we list. We back this up with many photographs, all with a close-up zoom option for detailed inspection. Items are not returnable if it was not of the age/value you were hoping it to be with no exceptions. If we place a date on an item we guarantee it to be of that period or earlier. We are very easy to work with and welcome any and many questions during our listings, so please let us know if you have one! Thanks again for looking! Antique, Vintage, Estate Jewelry & More! Most of our pieces are from the Georgian, Victorian, Art Nouveau, Art Deco and Mid Century periods and we adore the unusual and unique. We also have a passion for antiques and frequently come across interesting estate items while searching for jewelry which can be found in our store too. We are always adding to our inventory, so please check back frequently. Thank you for visiting our store! Auctiva Offers Free Image Hosting and Editing. Auctiva gets you noticed! 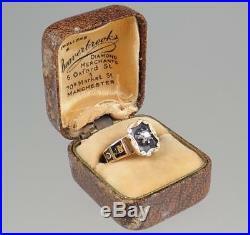 The item “Antique Victorian 18K Gold Mine Cut Diamond Memento Mori Mourning Ring 1854 S 6″ is in sale since Wednesday, November 29, 2017. This item is in the category “Jewelry & Watches\Vintage & Antique Jewelry\Fine\Victorian, Edwardian 1837-1910\Mourning Jewelry”. The seller is “liongoods” and is located in Minneapolis, Minnesota. This item can be shipped worldwide.